With it’s second season order already green-lit (before it’s series debut on Halloween night), it is safe to say that Ash and the insane horrors of The Evil Dead will not be disappearing any time soon. "All roads lead to Ash"
Are you a fan of the cheesy, humorous 1980's movies The Evil Dead? If you answered yes, you should be calling your television service provider to add the STARZ network right now. Premiering Halloween night, Ash vs Evil Dead is an hour long show showcasing our reluctant hero once again fighting evil spirits. Ash Williams (Bruce Campbell; Burn Notice) was in his twenties when he and a group of friends spent and evening in a cabin in the woods and found an old spell book. Unleashing a horrible evil, Ash was the only survivor that night, and has spent the past 30 years in hiding. All was fine until one evening recently, when, during a drug filled moment, he tried impressing a woman by reciting the ancient spell. In doing this, he released the evil to come and find him once again and finish the job it was unable to do that night in the woods, so many years earlier. Fans of the films will be happy to know Ash is his same anti-hero, ego-maniacal self, who is truly only interested in his own gains. Ash no longer is working at S-Mart, and is now living in a trailer park and working for an electronics store, trying to do the most minimal work possible while trying to also come on to, and get with, the most women possible. Director Sam Raimi skillfully returns to the series that started it all for him, giving audiences all the comedy, gore, and horror fans of the original trilogy have come to expect. Raimi and crew waste no time with exposition in the opening of the pilot, and give the audience what they crave - Deadites, and Ash, well, being Ash. However, the uneducated viewers/fans can still watch the series, as later on, it does explain how, and why, all these things are happening around Ash. The addition of the new characters in the series should help fill out the show nicely so people don't get an "Ash" overload. Jill Marie Jones (Sleepy Hollow), Dana DeLorenzo (Impress Me), and Ray Santiago (Touch) handled themselves well in the pilot episode, and while Lucy Lawless (Salem) only made a quick 30 second appearance, I do have high hopes for her character development further on in the series. With it's second season order already green-lit (before it's series debut on Halloween night), it is safe to say that Ash and the insane horrors of The Evil Dead will not be disappearing any time soon. Ash vs Evil Dead premieres this Saturday October 31, 2015, at 9pm ET/PT on Starz. 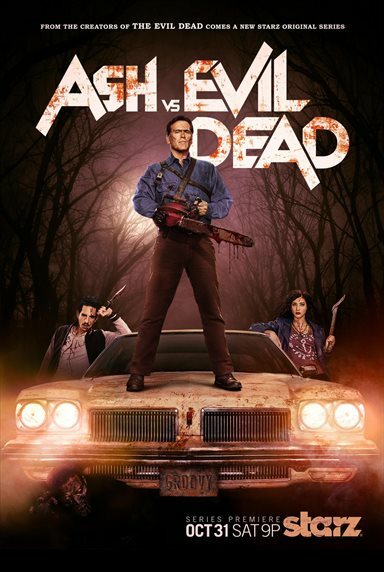 For more information about Ash vs Evil Dead visit the FlickDirect Movie Database.